L Falco peregrinus, Eng. falcon. The name of this bird of prey is derived from “sickle” for the hooked shape of its talons. Its claws are powerful. In northern Spain particularly the female peregrine was the most popular bird, which like the others was taken from its nest before it could fly to be trained for falconry. This sport is known to have existed during the 8th C. BC. 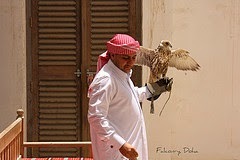 Merchants, crusaders and adventurers brought falcons and the art of falconry to Europe, including England and Spain. During the Middle Ages, it was a great sport for the noblemen. 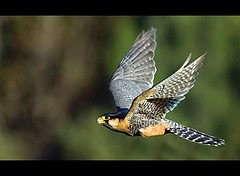 The kings and queens in Iberia and England practiced in it and displayed great pride in their own falcons. Some were passed down from one generation to the next as they can live 100 years. Pedro López de Ayala (1332-1407) in Libro de las aves, wrote extensively about their hunting methods in verse. In his 15 C Libro de caza de halcones, Alonso Velázquez de Trovar explains how to domesticate this bird. Female peregrines were trained to pursue other birds or game. The male is smaller and not as agile in the chase. The peregrine is most prevalent in Andalusia particularly and most of Spain. In Andalusia, medieval Muslims could have used the pilgrim falcon, L. Peregrinus brookei, a Mediterranean species of the peregrine as well. It should be noted that wild falcons can be destroyers of chicken coops, dovecots and wild game. Other types of birds of prey, eagles, hawks, vultures and owls also were used in falconry.They are trained to hunt hares, kites, storks, partridges, larks and other animals. With the invention of the shotgun in the 17th C, falconry died out except for today’s private falconry clubs. Not only were falcons used for the hunt in Al-Andalus, but they could be consumed as food too but rarely as the meat is tough and bitter. When consumed, it was marinated in a vinegar sauce and served with a sweet and sour sauce. It does not seem to have been a popular item in Al-Andalus menus for eating this bird caused melancholy. Jews, however, did not share this food. They interpret The Bible, Lev 11:13-19, as prohibiting the consumption of noxious birds, including the eagle, vulture, buzzard, kite, falcon, crow and raven, among others. In some countries the babies are baked, see águila. Ravens, falcons, kestrels, kites, eagles and vultures are hot and dry and digestion is slow. Physicians claimed that to eat falcons, kestrels and other birds of pray courage inflames the heart and raises and fortified the spirit. Avenzoar stated: The raven, vulture and kite are noxious, not tasty and normally are not eaten. The bile of these birds of pray was used to clean the eyes as a collyrium, to invigorate them. The baby falcons and kestrels were thought good tasting and raised the spirits producing beneficial, results especially for the hypochondriac type of melancholy and other kinds of melancholy. See cetrería and cinegética. Grease the hen all over inside and out with the sauce. Put it in a pot and pour the remaining sauce over it. Cook it. When done, remove from heat and let sit covered 15-20 minutes before serving. Se toma una gallina joven, gorda y limpiada; se corta por todos los lados y luego se le hace una salsa de aceite, almorí macerado, un poco de vinagre, ajo machacado, pimiento y un poco de tomillo. Se engrasa con ello la gallina por todas partes, por fuera y por dentro; luego se pone en la olla y se vierte sobre ello lo que queda de la salsa y se cuece, luego se saca el fuego de debajo de ella y vuelve a taparla y se deja hasta que se deshaga y ase: entonces se saca y se sirve. 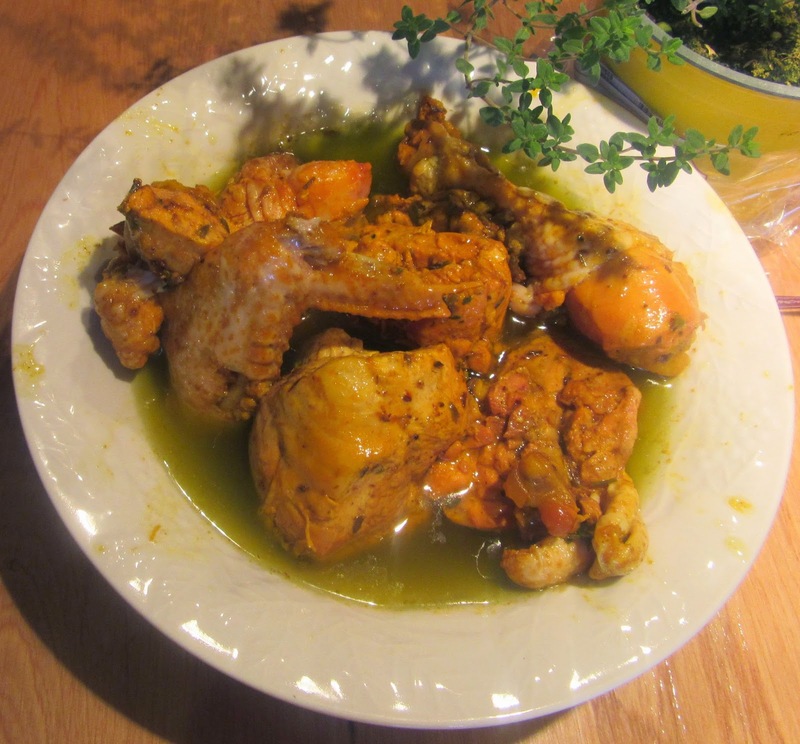 Take a young, plump, cleaned hen; slice it on all sides and then make for it a sauce of oil, murri naqî', a little vinegar, crushed garlic, pepper and a little thyme. Grease all parts of the hen with this, inside and out; then put it in the pot and pour over it whatever remains of the sauce, and cook it; then remove the fire from beneath it and return the cover to it and leave it until it smells good and is fried. Then take it out and use it.